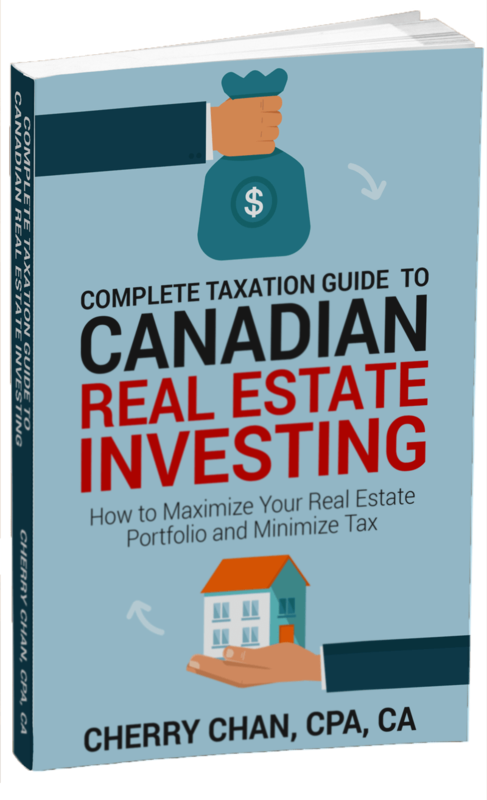 Get all the answers you need to start your own Canadian real estate investing journey. From basic taxation 101 to setting up a multi-layered corporate structure, this books provides a practical guide to maximize your deductions and lower your tax liability. Accountant. Investor. Public Speaker. Mother. Free weekly updates on real estate taxation for investors and realtors. New year resolution is tough. Waking up early is tough when you have an event the previous night. I’m already falling off the waggon on the 2nd week of January. But… it was a lot of fun doing a presentation on Airbnb. I spent half a day doing my own research confirming the HST impact on the sale of Airbnb. Most importantly, I enjoyed doing the research and learning something new. The host of the event, Davelle Morrison, from Bosley Real Estate, has two Airbnb rentals. What surprised me the most was that she owned one in Price Edward County, a place where one of my clients also owns an Airbnb rental. She was telling the crowd that she provided nice salt and pepper, Keurig coffee machine and the Sand Bend Beach Pass in the past season and got a great review. One visitor commented how he wished she would provide olive oil in the past season. She decided to add that to her list of items being provided. Thanks Davelle for a great event! In Canada, if you operate a hotel, you’re providing a service, not rental income. What it means is that if you own a hotel in a corporation, revenue from the hotel is considered active business income, taxed at a small business rate of 12.5%. This means that, instead of paying as high as 54% personal tax rate, your hotel income can be taxed as low as 12.5% in the corporation. We, as accountants, have a lot of flexibility to lower your taxes for you. Now, how’s a hotel different from a regular rental? The hotel provides a list of services, such as laundry, towel, maid, cleaning, coffee, internet, linen, cribs, fridge, beverages, meals, etc. They sound familiar, don’t they? If your Airbnb is operated as if it is a hotel, and hotel income is considered as active business income, does this mean that your Airbnb income can be reported as active business income? This can also mean that you can pay as little as 12.5% if you earn the Airbnb income in the corporation. Of course, when you take out the money, you may trigger personal tax – something to discuss with a professional. Before you get all excited about the low tax rate, always remember, with CRA, we need to document everything we do. If you do provide these services, make sure you keep a copy of the Airbnb ad to what you provide. Make sure you have communication, or even comments printed out/documented somewhere that they enjoy all these additional services you provide. What if you don’t provide olive oil and Sand Bend Beach pass, can you still pay less tax? Well, a proper structure would help. We recently helped our clients to structure his Airbnb rental and services to minimize his taxes and maximize his borrowing capacity. If you’re confused, I am going to do the same presentation in an upcoming event in Mississauga. You can get tickets using this link. If you’re not interested in Airbnb, my client, Steve Ford, and my good friends, Charles & Andy, are going to talk about their small infill development progress in St Catharines at the same event. The project is interesting – they are creating something out of nothing. 😉 They already locked up their second site for a second development. As an entrepreneur, I just completed my annual goal review and goal setting exercise. One of the things I noticed from my review was that I had been lazy in 2018 – didn’t follow much of my regular morning routine. 2019 is the year that I want to get back on track, make it my lifestyle and never look back again. Fun time with family and friends over the holidays. Getting up early allows me to have a head start of the day. This includes working on stuff that I struggled to find time to do during the day when the busyness kicks in. This blog post was written before 6 am. As embarrassing as it may appear to you, I also noticed from my annual reflection that I didn’t pay nearly enough attention to how I spent my money, including how I grew my business on the payroll, operating expenses, etc. I’m only half way through the book but I am so fired up to use his system, and I will share what I have learned so far with all of you. This applies to both business owners & employees. The author, Mike’s mom, had a part-time job when he was a teenager. Some weeks she got paid a bit more. Some weeks, she worked less and got paid a bit less. Community,” “Fun Money,” “Vacation,” and “rainy-day”. She would put 50% into her mortgage envelope, 15% to vacation, 5% to fun money and 10% each to the rest. Her mortgage was 40% of her pay. She chose saving 50% because there were weeks that she had fewer hours and there were weeks that she had more hours. In case of bad weeks, she would always have the rainy-day envelope as a back up. Mike’s mom never missed a mortgage payment, and he always felt that he had more than enough. Our brains are wired to use our bank account balance as a measuring stick to our financial health. This system simply takes this habit to the next level. You will always have a separate bank account for mortgage and household expenses, such as property tax, utilities, insurance, kids’ daycare and life insurance, etc. Those are non-negotiable, and you can never touch them. Be like Mike’s mom, allocate more than you truly need to, so you always have a safe cushion just in case. Also setup a separate account for “rainy-day”. This is also an account you cannot touch. Once the money goes in, it can never go out, unless the true rainy days come. Using the allocation percentage above, she has 40% left for food, vacation, fun money and community. Limit your spending on these categories, whatever it would be. If you net (after tax) $5,000 per month, this means you’re left with $2,000 on food, vacation saving, fun money and community. I have never applied a system like this in my personal life. I’ve always relied on the traditional profit & loss system to tell me how much I’ve made for the year. After all, I went to school to be an accountant. I got a professional license learning how Income – Expenses = Net profit. I put my focus on income and my expenses. Net profit would automatically be there. That’s exactly how I have been managing my own money. At the end of the year, if we’re lucky, we have something left in our bank account. If we are not lucky, we don’t have anything left. How wrong was I?! How flaw is Income – Expenses = Net Profit? Although my kids are only 3 and 5, it’s always in the back of my mind to teach them how to manage money. This Envelope System is exactly what I would teach them. Take away your daily obligation, take away your rainy day funds and take away your savings before you spend. You can always find a way to spend within your limit. If you are struggling with saving for your first investment property downpayment, try this envelope system. If you are tapping into your line of credit to pay for your holiday spending, try this envelope system. Years ago, I met with a prospect, and he came in with his wife for a consultation. She’s also an accountant. They both made a decent amount of money, but they both felt that they didn’t have enough to spend. Husband and wife both made 6 figures. In Ontario unfortunately, $150K payroll would give you $100K of take-home income. If you’re also making an RRSP contribution and paying for additional benefits, this $100K can be less. $100K is roughly equivalent to $8,300 per month as spending. A pretty decent amount, isn’t it? If both husband and wife are netting the same amount, you’re doing REALLY well. Two kids were in private school, each costing $20K each annual tuition fees, plus all the incidental cost. Easily $4K per month. Large home in GTA with an $800K mortgage. Easily $3,500 to $4,000 per month. With a large home, it comes with a large operating expense. This can easily be $1,500 to $2,000 per month. I didn’t have the tool that equipped me to help them. I do have it (at least I’m half way through the book) now. I didn’t have any solution provided to them, other than saying that they would need to cut down on their expenses. The conversation wasn’t easy. The car was on 4 year lease, the kids need their best education, and the motorcycle was only $700 a month. Accountants do not have the magic wand to lower your income taxes, especially with people who earn employment income. Our hands are tied. Even if we could save tax, the tax is only part of the equation. Not the entire solution. It starts with making difficult choices and taking care of your own money. I am going to leave you a couple of tax tips you may want to consider (rush to do) before the end of this year. Made some capital gain from selling off your properties in 2018? You may also have some accrued capital losses on some of your other investments such as stocks? This may be a good time to sell some of these stocks that are losing money. Triggering the loss within the calendar year 2018 would allow you to use these capital losses on stocks to offset the capital gain you have from selling off your properties. You can always buy theses tocks back in the new year. The only catch is that they would have to repurchase the stock 30 days after the sale. If you do that before the 30 days deadline, the loss that you create before the end of the year is deemed superficial loss by CRA. No capital loss can be claimed. If you are planning to sell assets or investment that have accrued gain on them, you may want to defer the sale to 2019. This will allow you to defer the capital gain to 2019, and paying the tax bill a year later. It’s almost impossible to do any tax planning if you are a high paying employee. However, if you have a lower income spouse, you may want to make some spousal RRSP contribution. When you make a spousal RRSP contribution, you can take the deduction in your own name. The spouse is the plan owner, and only the plan owner can make the withdrawal. As a result, the spouse can make the withdrawal (subject to some rules) in his/her name in two years and have the income included in his/her income. The spouse can only withdraw the RRSP and include the income in his/her name, if and only if there is no spousal RRSP contribution in the previous two calendar years. As a result, if you make an RRSP spousal contribution at the end of 2018, your spouse can withdraw the money as early as 2021, provided that you don’t make any more contribution in 2019 and 2020. If you have a low income this year, consider withdrawing RRSP before the end of the year. This way, the RRSP withdrawal is included in your income in 2018. The marginal tax rate is low when you have a low income, your tax bill at the end will be cheaper than withdrawing it in a year with high income.